This walk: 2016-2-10. 12 miles stone, Grimstone & Sortridge Leat, Reddicliffe Farm, WB / SB parish boundary stones, waste pipe, beech trees. Previous walk in this area: 8th May 2013 and 9th September 2015. 12 miles stone on the old Plymouth to Tavistock road, at SX 51647 72368: behind this is the Grimstone and Sortridge Leat that still supplies water to local farms. The leat is approximately seven miles long and dates from the 14th Century, when it originally supplied water to Grimstone Manor and later (16th century) to Sortridge manor. Another view; the standing water gives an indication of recent weather - it was raining again today! Leat side-branch to the farm - looking south, away from the farm. Someone taking revenge for a certain photograph from 9th Sept. 2015 - this one, to be precise? Overview, showing the stone's proximity to the road. The art of Dartmoor hedge building, with carefully interwoven stones - or the use of eave-filling concrete remains from the old Plaster Down Camp. This was a 1943 British Army hospital that looked after wounded Americans following the D-Day invasion. It was used for Polish refugees after the war and in 1971 it housed ejected Indians from Uganda when Idi Amin threw them out of the country with no possessions. Building in a field associated with the management of waste from the camp. Part of a hospital bed, in a hedge. It was here that someone left their shoe in deep mud, that had had the appearance of solid tarmac! Looking in the opposite direction, the leat disappears into private land, running into Sortridge. From this point, the road runs past Fullamoor Farm: it was here that an RAF Liberator bomber crashed on 31st October 1942 while trying to land at RAF Harrowbeer with the loss of six crew with one survivor. After the walk, I surveyed our estate and found this camellia, perhaps already past it's best condition - a sign of climate change? 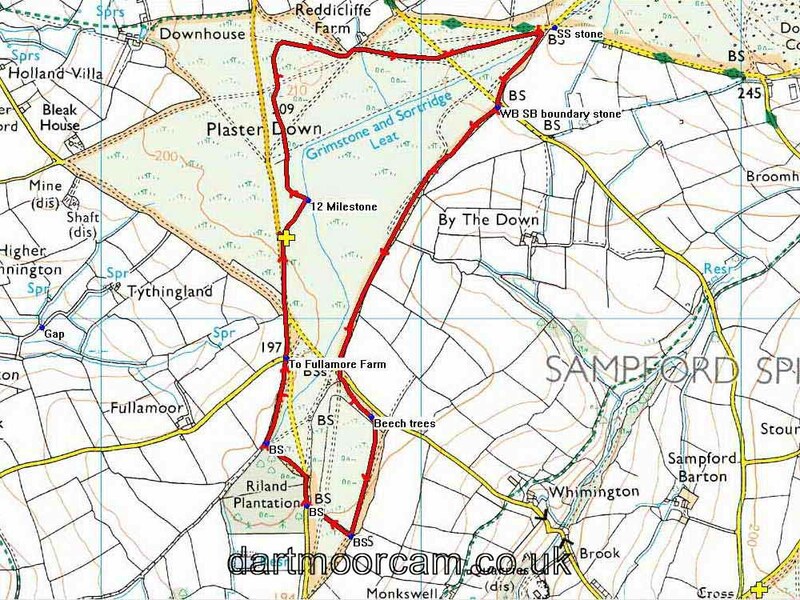 This walk can be reached from either Horrabridge (up Jordan Lane) or Tavistock (across Whitchurch Down); plenty of parking on firm ground on the east side of the road at the site ,arked by the yellow cross.